Blog » THIS JUST IN: Monster's Campaign Blog Tour a SUCCESS! THIS JUST IN: Monster's Campaign Blog Tour a SUCCESS! Happy Book Birthday to Monster and Boy! 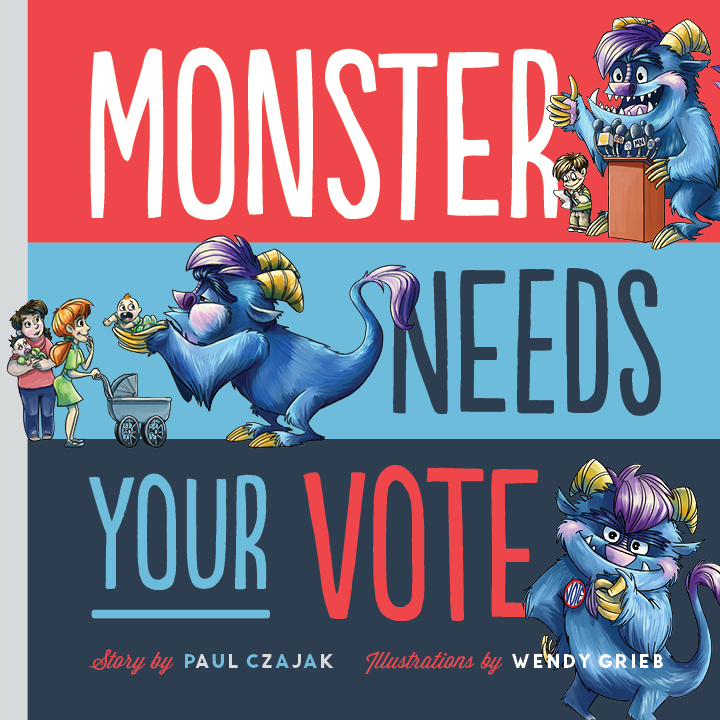 Tomorrow is the publication day of Monster Needs Your Vote, the most recent installment in Paul Czajak and Wendy Grieb's Monster & Me™ series. Monster and Boy have been very busy on their campaign for literacy, learning, and education for all! Starting their campaign off with a BANG at ALA 2015 in San Fransisco, CA, they continued on to a successful blogtour. "We'd like to extend a heartfelt THANK YOU," proclaimed Boy, "to all of the wonderful bloggers who flew Monster's star spangled blog tour banner!" "It's a great platform that I think we can all stand behind. And even though it turns out that Monster doesn't meet the legal age requirement for the presidency, the book's message is clear that it's not about winning any campaign or contest, but rather what's most important is getting the message out. Now that's something we can all be encouraging with our students and our readers, isn't it? The message that their (our) ideas have weight, have value, and these ideas matter in helping to shape our world." "Monster’s focus on education and literacy makes this a great classroom and library read-aloud – never talking down to the youngest of readers, Czajak Grieb use rhyme and adorable, kid-friendly illustration in eye-catching, bright colors to talk to kids." "It is clear to me that Monster makes the perfect candidate, given his persistence, comic antics, and Boy's unwavering support ... Wendy Grieb's illustrations have remained consistent between books, helping to endear the Monster & Me brand. Her palette is bright when needed, like the stunningly red full-page background that makes Monster and Boy POP!" "This timely, informative and fun book will help spur interest in a very important part of our government—the presidential election. Paul Czajak has written the story in an easy, flowing, rhyming verse, so it is an enjoyable read-aloud for all ages. It is would be a great resource and mentor text for any type of social studies activities that you would do to bring greater understanding of the election process to your students. " “Monster Needs Your Vote” is an absolutely adorable book that will help get kids thinking about elections and politics in an encouraging and nonpartisan way. And you can bet that Monster will have some fun along the way!" ANNOUNCING Monster's Twitter Takeover 2015! Classrooms across the country will be tweeting what students think about things they wish their President knew. Join the fun by watching and contributing to the #IWishMyPresidentKnew hashtag, or following @MonsterROARS on Twitter. Don't forget to check out Monster's CAMPAIGN KIT to supplement this new title, of course. You can wish Monster and Boy a Happy Book Birthday on their personal Twitter HERE. Learn more updates about how the campaign is going HERE.